Today it was officially announced the investment that we have made together with Damian Voltes at Sumavisos.com. A company where I see a “strategic fit” to be able to add value and help them clearly on escalating on the business. We continue looking for companies that fit our strategy of investment, with similar characteristics that understand the value that we can add. This is an an official press realease. 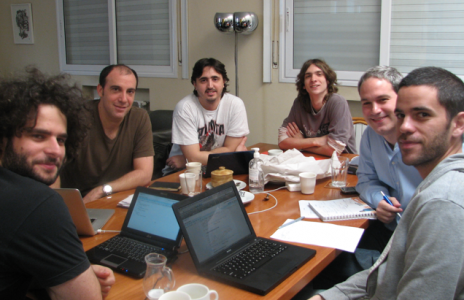 Buenos Aires, Argentina, August 11 2009 – Sumavisos.com, the search engine for classified ad for the Spanish and Portuguese speaking market, announced that they have successfully finished the first financing round led by angel investors Damián Voltes and Ariel Arrieta, that will allow them to continue improving their search technology and the regional expansion. Gabriel Gruber, co-founder and CEO of Sumavisos stated: “it is a big step for the company adding the support of two successfull entrepreneurs and investors such as Damián Voltes and Ariel Arrieta. Their participation allows us to complete our team to be able to become the leader search engine for classified ads in the Spanish and Portuguese speaking markets”. Damián Voltes, CEO of Patagonia Ventures, indicated: “Sumavisos has a great team and their search technology allows users to efficiently look for classified ads for cars, real estate and jobs. Together with Ariel Arrieta we believe that Sumavisos will be a referent to the vertical search business of classified ads in our region”. Sumavisos was founded in December of 2007 by Gabriel Gruber, Martín Sarsale and Damián Martinelli in order to simplify the searching process for real estate, then after one of the partners found his house through an algorithmic programing that automatically search on the Internet with the desired criteria on all classified ads on real estate of his neighborhood. The main objective of Sumavisos is that the user can do an only search that includes the main sites of car, real estate and job classified ads. In addition, it offers tools such us geographic view of the property, the average price in the market of the current ads, stock statistics, the possibility of saving ads and receiving email alerts when an ad useful for the user appears. In 2008 Sumavisos was selected as a winner of the program Buenos Aires Emprende where they received a contribution from the Government of the City of Buenos Aires, with Centro de Entrepreneurship from IAE as a sponsor. Sumavisos already has more than a million of ads that have been indexed and they are available in Argentina, Brazil, Chile, Colombia, Spain and Mexico. Damián Voltes is a serial Internet entrepreneur and venture capital investors. Currently he is founder and CEO of Patagonia Venture, a venture capital fund at its “early stage” focused on start ups of TIME (Telecommunications, Internet, Media and Entertainment) industry, mainly on the Latin American market. Ariel Arrieta is a serial entrepreneur and angel investor. Currently he is serving as Senior Advisor of .FOX Networks (a News Corp company) and Partner and Angel Investor of several companies such as Nextperineces.net and OnTrade.net, among others. Previously Voltes and Arrieta co-funded Digital Ventures, Directa Networks, Performa Networks, Afiliados Hispanos and InZearch, all of them online companies acquired byFOX in July 2007. This entry was posted in Entrepreneurship and tagged Damián Martinelli, Damian Voltes, Gabriel Gruber, Kayak, Martín Sarsale, Oodle.com, sumaavisos, sumaavisos.com, sumavisos, sumavisos.com, Vast.com by aarrieta. Bookmark the permalink.